Throughout my time at UW I have spent significant amount of time working at the Burke museum. I have learned in college that I love biodiversity. It fascinates me that thousands of years of evolution can turn one group of animals into many different forms and variations of one another yet all with the same common ancestor. The organization of taxa in this way has always been captivating, but it wasn’t until FISH 311 that I learned this science is properly called systematics. This was a perfect class to take after my paid internship the summer prior where my 4 brave cohorts and I relabeled and organized the largest collection of otoliths in the world. Otoliths are fish stone ears that aid fish in sensing their environment by detecting gravity and acceleration. Otoliths add a layer of calcium each year from the environment so you an otolith can tell you the age of the fish as well as the components of the ocean every year they are alive. Cool stuff. My peers and I grew very close over the summer so it was perfect timing to take this course. My professor was also my boss! A lot of new age education seems to be focused on giving students just the tools, so they can turn around a fashion the knowledge for themselves. I have strangely found, that I rather enjoy receiving knowledge already in its finalized form. I might not grow as a thinker, relative to a course with more problem solving. 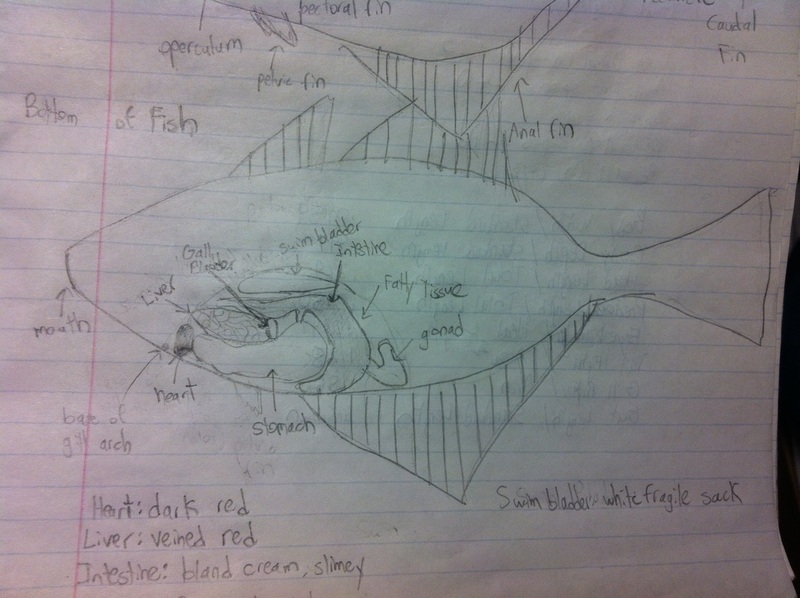 Memorizing fish orders and evolution paths was fun! Another component of the class that rocked was the lab sections. My two highlights were: dissecting a gravid dogfish (a species of shark) to find three baby sharks! I also dissected a big mouth sculpin and found two whole fishes in its stomach. One of the flatfish that my fish ate was just as big as the flatfish being dissected by the lab team beside us!